If you love animation and you don’t mind the shameless plugging of Disney, you are likely to enjoy this film. Ralph (Reilly) and Vanellope (Silverman) remain fast friends, and have discussions about their attitudes toward their lives, such as that Ralph is completely happy and Vanellope finds day-to-day a little boring. Racing is easy peasy (she has only three tracks now), although she still enjoys it. After a bit of thought, Ralph is sure he can make her life more exciting by building a new track for her. He does, and although it’s a bit dangerous, Vanellope is thrilled. When they go into the Litwik Arcade, they discover that a player of Sugar Crush has broken the steering wheel trying to keep up with Vanellope’s rough ride. Now there’s a crisis, because a) a new one costs more than the game earns in a year; and b) the company has gone out of business so there’s no way to order a new part. But wait! Someone has heard of eBay (a name Ralph has trouble remembering, wanting to call it “eBoy”), and has found a new steering wheel for sale. Neither of them is familiar with the internet, which has just gotten connected in the arcade, so the two sneak past the yellow ribbons barring entry and come upon the wondrous site of the internet. This is even glorious for the viewer to behold. Disney has created a physical representation of the internet that captures the color and endless activities it contains, even including pop-up ads, pop-up blockers, and spam (owned by the Spamley family). (All of which is especially appreciated by adult viewers.) Ralph and Vanellope find eBay without much trouble, and see the coveted steering wheel on auction. Since they’ve never attended an auction, though, the two will learn a hard lesson from their mistakes here. And learning that lesson will take them into adventures and eventually a test of their close friendship. In their efforts to earn enough money to buy the steering wheel, Vanellope is introduced to Shank (Gadot) and her thrilling Slaughter Race. Ralph is introduced to internet social media a la Instagram, BuzzFeed, Tumblr, and Twitter, and becomes a hit guided by Yesss (Henson) of BuzzFeed. By posting entertaining videos of himself doing all kinds of bizarre things (the more bizarre the better), he starts earning hearts that can be cashed in. As he begins earning enough money to get the steering wheel, Vanellope has gotten involved in Slaughter Race, and making friends with Shank. 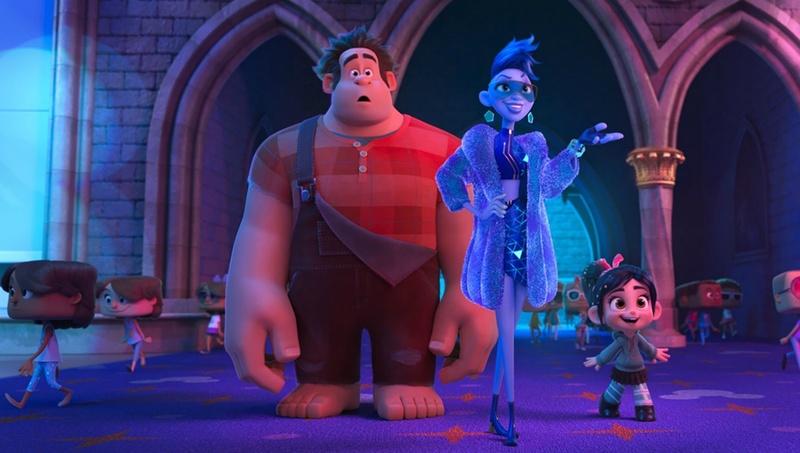 In agonizing scenes thereafter, Ralph and Vanellope will learn about internet viruses that spread from “insecurities” (double entendre here) and shut down games. An entertaining film about the internet with a clever representation, spiked with prominent Disney product placement.